enables easy integration into various solutions. 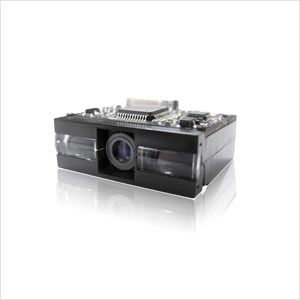 optical, CMOS, digitizer, decoder, image processing & embedded systems. The scanner supports all global standard 1D barcode symbologies. machines, PDAs and many more. Code128, EAN-13, EAN-8, Code39, UPC-A, UPC-E, Codabar, Interleaved 2 of 5, ISBN/ISSN, Code 93, etc. The Evaluation Kit for EM1300, with trigger, beep functions and USB, RS232 interfaces. This cable connect to the RS232 port of EVK1300. With a standard female RS232 port to connect to standard male RS232 port. With a power port to accept power adapter supply. This cable connects to the USB Slave port of EM1300 with a USB-B male port. With a standard USB Slave port to connect to standard USB Host port. The power adapter for EVK1300 by RS232 Cable.